The V91HD/DLT is a high energy, bulk eraser especially designed to tackle the erasing of computer hard drives and DLT tapes. The vulnerability of information stored on PC hard drives is a recognized security risk. 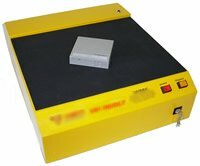 Using a hard drive degausser such as the V91HDD/DLT is the most effective and quickest way of eliminating information from hard drives  even faulty hard drives. With just 4 rotations over the magnetic field, you can be confident that hard drives have been completely erased, ready for final disposal. Anyone replacing their existing DLT drive with the new DLT1 drive should be aware that their existing DLT tapes will be unsuitable for use with the new drive. The formatting needs to be removed and using the "erase" function on the tape drive is simply not sufficient. The only way to remove the formatting is by degaussing the DLT media. Degaussing removes all magnetic patterns from the tape, thus eliminating all data and formatting. The V91 HD/DLT will erase DLT tapes in 20 seconds, leaving them completely clear and ready to use in DLT1 drives. Degaussing also ensures the user that their next recording will be at its very best. The only way to safeguard complete and permanent erasure is to use a degausser. Al though in most cases this will render the hard drive inoperative, the cost of a replacement hard drive cannot be compared to the cost to a company if sensitive information can be read by a third party. In addition to degaussing DLT media so that it can be used in the new DLT1 drives, degaussing DLT media has a number of other benefits. Degaussing DLT and other magnetic media can extend its life, which in turn delivers cost savings. Many operators claim benefits of up to four times the useful life of some types of media. The reduction in down time of computers & data processing apparatus arising from faulty or imperfect media is an expense which can be eliminated by degaussing media. And finally, quality in the performance of degaussed media has also reported to be of high value to users and improves efficiencies. Note: After degaussing, hard drives (and some media) are not reusable. 3590,9840,9980 & LTO data back up tapes can not be re-used. Server hard drive cradle should be removed before degaussing. Warranty: 36 months back to base.